Matthew Mott will leave his post as Glamorgan's head of elite performance at the end of this season. 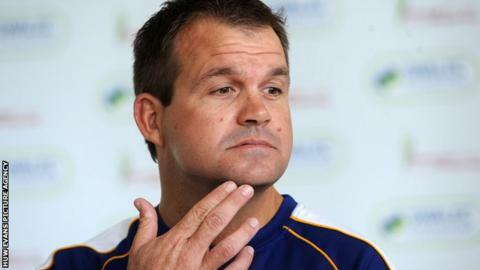 The former New South Wales coach joined Glamorgan in January 2011 and was appointed Glamorgan's head of elite performance in February 2012. Mott, 39, replaced former coach Matthew Maynard. "I would personally like to thank Matthew for his contribution to the club over the past three years," said Alan Hamer, Glamorgan chief executive. "I've enjoyed working with him and I wish him and his family the very best for the future. "As soon as the current season has ended, we will commence the process of identifying a new 1st X1 coach. "Our immediate focus is on winning our final two YB40 group matches and to finish as high as possible in the LV County Championship." Mott, who informed Hamer earlier this month of his decision to return to Australia, will continue to remain in charge of the first team until the end of the season. The Welsh county have failed to challenge for trophies in the past two seasons. Glamorgan have won just one of their 11 Division Two County Championship games this season, although the weather has contributed to six stalemates. They had been challenging in the Twenty20 after a fine start to the campaign but Glamorgan's form tailed away. Glamorgan needed to beat visitors Gloucestershire in Cardiff to claim a quarter-final spot, only to lose by nine wickets to a side that was bottom of the table. Glamorgan now have to win their last two games to stand any chance of qualification to the knock-out stage. Meanwhile, the county have also announced captain Marcus North will be heading back to Western Australia after their final YB40 group match against Yorkshire. North will join the Western Australia squad as they prepare for next month's Champions League and also the start of the new Australian cricket season.